The real life World’s Fair in Chicago was an amazing showcase of technology, science, entertainment, and culture. In the tabletop incarnation of the event, you take on the role of one of the fair’s organizers, and you’ll work to increase your influence throughout the fair to obtain the exhibits that will be put on display. 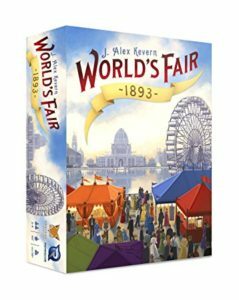 World’s Fair 1893 takes a lot of my favorite game mechanics (set collecting, card drafting, and area control) to create its own style and delivers a very well done strategic experience for 2-4 players. I also thoroughly appreciate that the cards used are historically accurate and chock full of facts. You, too, can dazzle your friends with facts about the 38-foot tall pavilion made out of 30,000 pounds of chocolate. As for gameplay, on each turn, the active player will send one of their supporters to one of the five areas in the board, and collect all of the cards at that location. New cards are then added, draft style, to that location as well as two others, and the turn ends. The cards represent proposals for the exhibits (matching the five areas), influential and historical figures who can affect placement of your supporters, and midway tickets that can bring you closer to the end of the play phase and onto one of the three scoring phases. During each scoring phase, players gain reputation points for having the most supporters in an area and for gathering the most midway tickets. For each area controlled, the controlling player can then turn exhibit proposals into approved exhibits that match that area. Final scoring is based on the variety of exhibit areas, as well as the quantity of exhibits. Collecting sets of one exhibit for each area will gather the most points, so be ready for some planning ahead! World’s Fair 1893 delivers a great two-player experience, and shines especially bright with four, so bring some friends and check it out from our game library!